With FastTrack Automation Studio, you can connect IP printers automatically for users, just as easy as connecting printers from a print server. 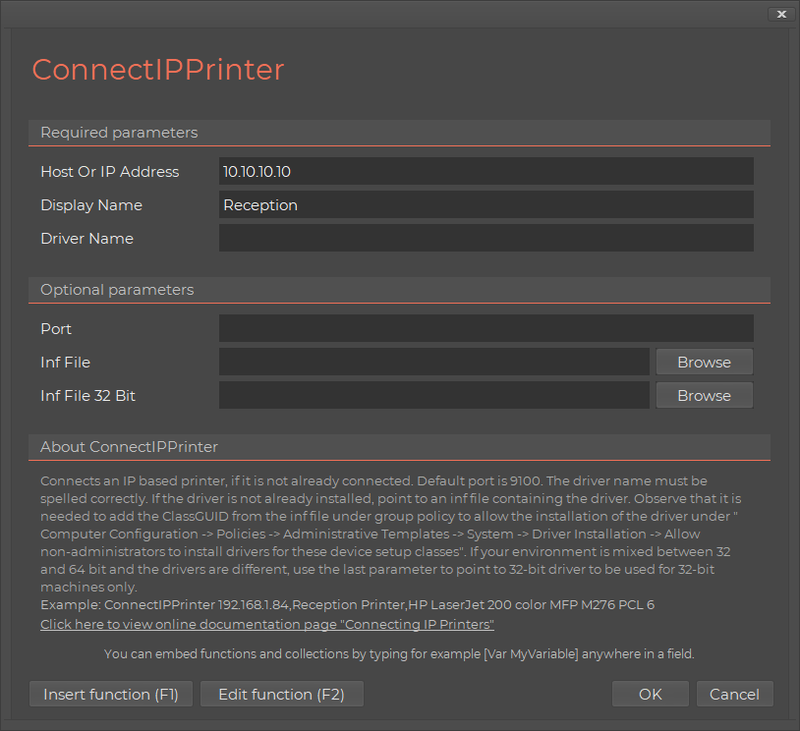 You can connect printers using rules or location menus and you can mix with print server printers. Read on for a walk-through. The first step to connect IP printers is to set up a logon script. You do this by using the Logon Script icon in the Home Screen, as shown below. We will not go through this process on this page though, please refer to www.fasttracklogon.com for detailed description of how to do that. Once you have your logon script in place, you add a printer by using the "Add IP Printer" button under printers. You can mix IP printers and print server printers and you can use IP printers both for printer menus and rule based connections. First you have to enter either the IP address or the host name of the printer as the first parameter. 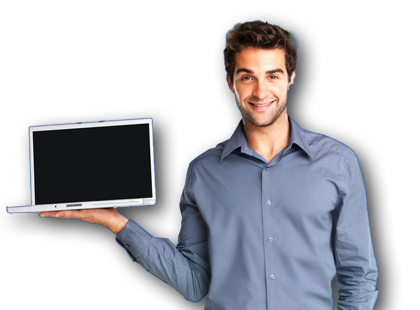 There is no reason to have printers on fixed IPs, as you might as well connect using their host names, so you do not lock the client connection to a fixed IP, in case you need to resegment your network at a later time. The display name is the name, as it appears for the user in the printers list. You use a driver that is already installed. 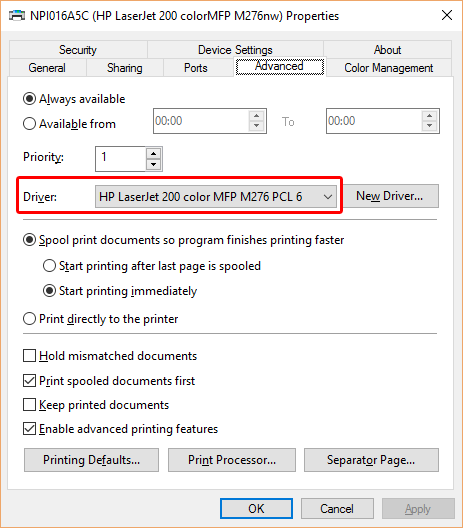 The driver is not installed, so you need to install a printer driver as part of the connection. For scenario one, you need to enter the driver name. 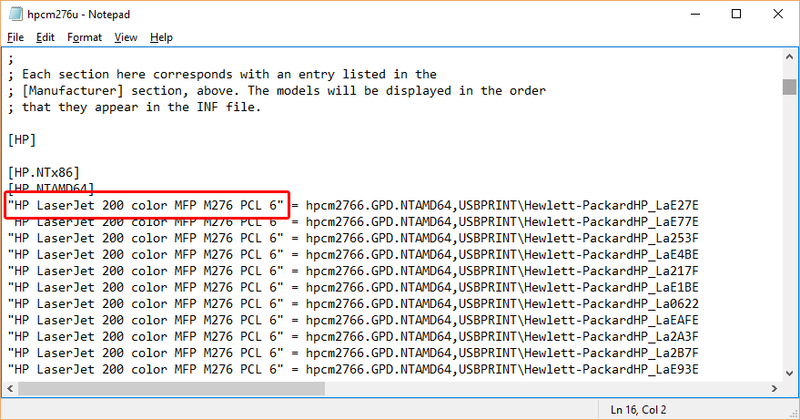 The easiest way to find it, is to look at a computer that already has the printer mapped and click properties, as shown below. Make sure you write the text in the "Driver Name" field exactly as it appears. You can also find the name by typing "Printui /s /t2" at a command prompt to pop-up all printer drivers installed on a computer. In this scenario, you are done. Just add more printers. 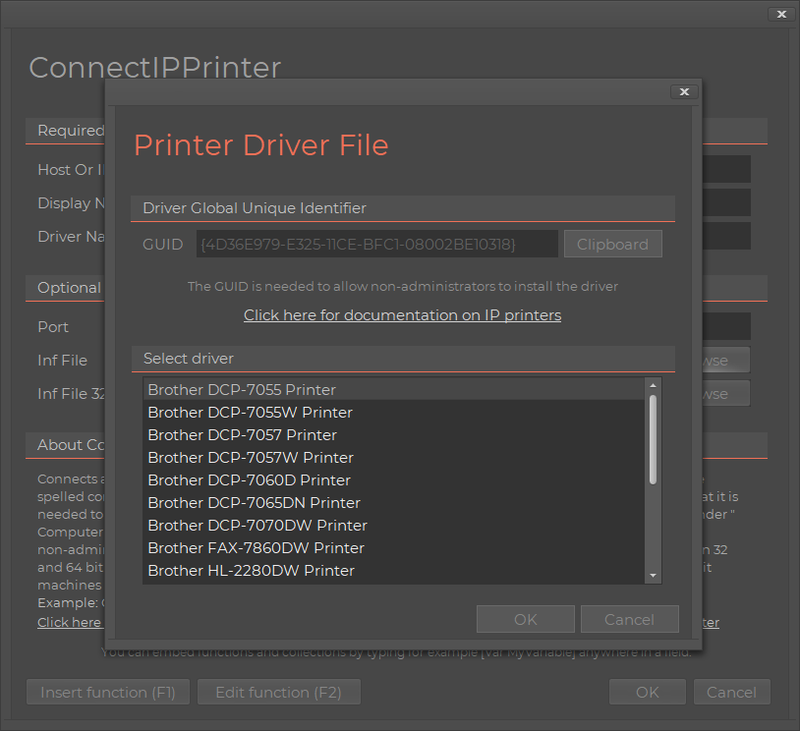 Pick the correct printer driver from the list. Once you press OK, both the driver name and path will be filled in correctly. In case your environment still has 32-bit machines, you need to point to both a 32-bit and 64-bit driver. If you do not, leave the bottom 32-bit field empty. 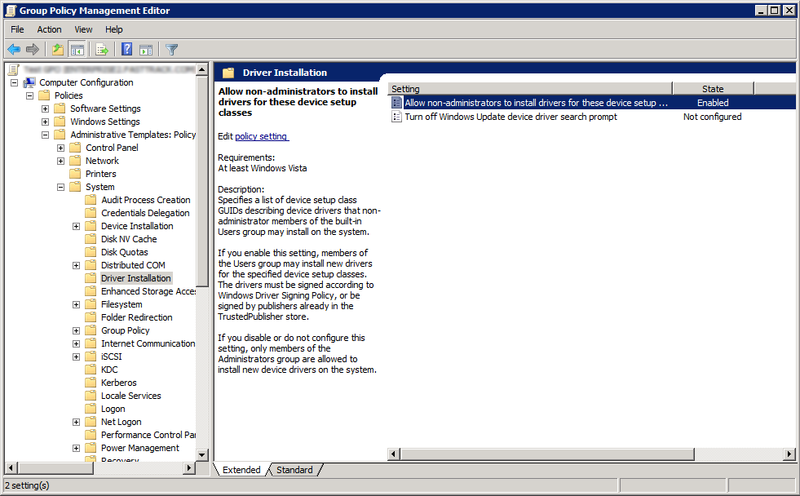 Now, the GUID (globally unique identifier) is how you tell group policy, which driver is allowed. If you use the "Clipboard" button, this value will be copied to the clipboard. 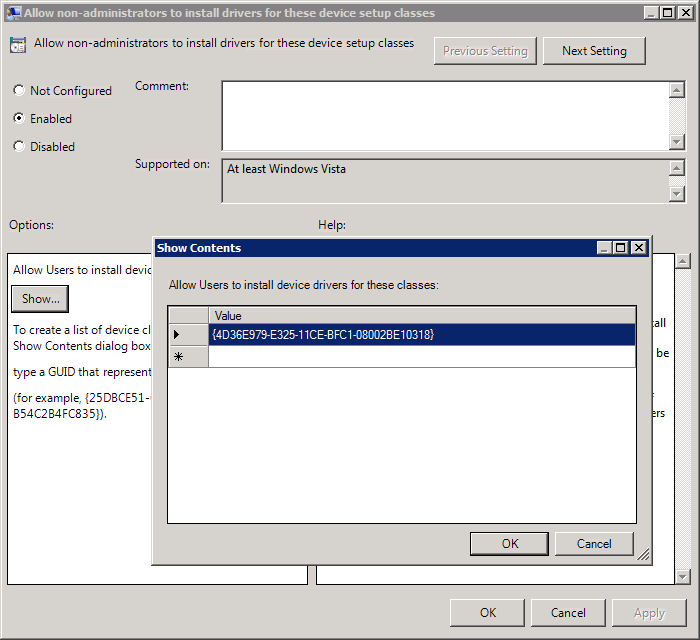 You need to open group policies and locate "Computer Configuration -> Policies -> Administrative Templates -> System -> Driver Installation -> Allow non-administrators to install drivers for these device setup classes". Here you need to add the GUID using the "Show..." button, as shown below. 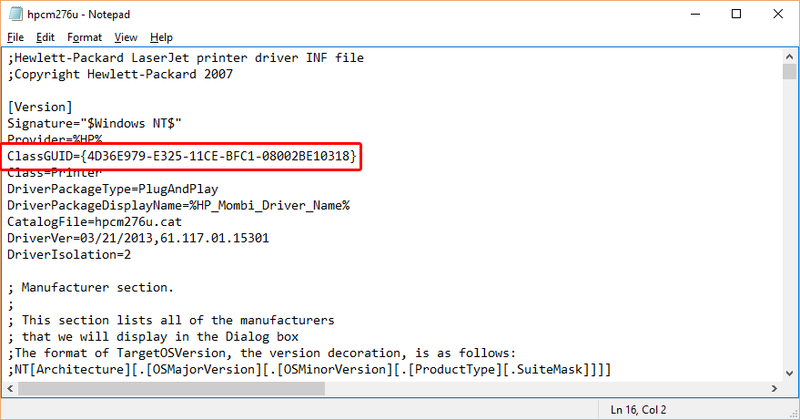 The GUID and printer driver names can also be retrieved by simply opening in the inf file in the printer driver directory. The GUID is the "ClassGUID" at the top under the "Version" section. The driver name can be found further down in the file, as shown below.